I try to make a point of looking on the bright side of life. But sometimes, I just ... can't. 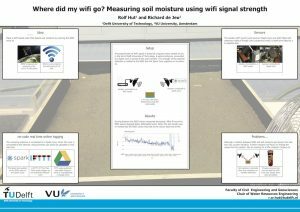 This morning I stumbled1 on recent research from Microsoft that showed that WiFi (and potentially Bluetooth and RFID) technologies can be used to measure soil moisture. Very important to farmers, because this means they can base agricultural decisions on low cost sensed data from their fields. I should be happy, this is great research and it shows one of the points I always try to make: economies of scale in consumer electronics lead to reduced cost in specialty fields such as environmental sensing. The problem is that I made that point two and a half years ago, when I submitted my VENI proposal to the Dutch Science Funding Agency NWO. VENI's are a big deal: receiving one kickstarts your scientific career. It comes with enough research money to hire your first PhD student and usually Dutch universities offer tenure track positions to those researchers that received one. No surprise that after receiving my PhD and deciding I wanted to pursue an academic career, I put in my best idea so far for my VENI. I thought, given my understanding of both water, soils and physics, that the radio-waves from WiFi and other consumer electronics would be sensitive to changes in soil moisture and that we could pick this up. I was pretty confident in this, because I had already made a working prototype that I showed at the EGU conference in 2015. I was therefore quite shocked when I received a very fast rejection. Due to the large amount of proposals the NWO (non scientific) staff made a first shift where fifty percent was rejected before sending out the rest for peer-review. My proposal was rejected by a desk bureaucrat on grounds of it being "unclear where the innovation is". I'm happy (I guess...) that one of the largest and most profitable tech companies in the world does think that there is innovation in the idea of using WiFi for soil moisture sensing. It doesn't help my academic career and I'd rather have worked on it myself with my team the last two years, but at least the idea is executed on. I moved on. After my failed VENI proposal I worked on the eWaterCycle project, building a global Open Source River Discharge Forecasting system. This year, we got the eWaterCycle II Flagship project funded where a team of hydrologists and computer scientists are together building an environment that lets hydrologists run, manipulate, compare and couple models on the fly without having to become a computer scientist. All cool science and I'm happy to work on it. But in all that "I'm good" happiness: getting the news that the work suggested in the rejected proposal that was supposed to kickstart your career is being done, just not by you, hurts. If you're looking for me today, I'm in a corner, reconsidering why I want to be part of the academic proposal rat race in the first place. PS the complete text of my original proposal can be found here. I fully recognise that proposals can also get rejected on how you write it, not what you write. I even recognise that NWO gets a lot of proposals and can't in good faith send all of them out. As is often the case: it's the system that I hate, not the puppets in the system. 1 I stumbled on the research through the very interesting blog page of Bill Gates.